Thanks goodness, the Lyric Opera of Chicago’s “Il Trovatore” has much more going for it than the famed “Anvil Chorus” (“Vedi le fosche notturne”) in which some of the workers overdo their loud clangs, forgetting that the gypsies are singing to Verd’s music and the anvils ought to be an interesting accompaniment. This production is an opportunity to hear Soprano Tamara Wilson, making her Lyric debut as Leonora . 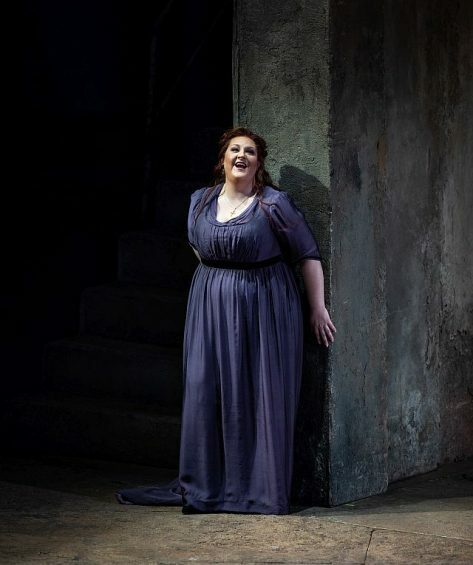 Wilson lets the audience know right away that she was well chosen as the doomed heroine with her “Tacea la note placida, a beautiful cavatina with its high c, and the passionate “Di tale amor che dirsi” aria made even more impressive by its trills. It is also an opportunity to hear mezzo-soprano Jamie Barton, last heard at the Lyric in as Giovanna in Donizett’s Anna Bolena in 2014. The two female leads definitely are up to Giuseppe Verdi’s vocal challenges. As Azucena, daughter of a gypsy burned at the stake, Barton easily handles Verdi’s challenging vocal range as she sings “Stride la vampa!” (“The flames are roaring”) and then, “Condotta ell’era in ceppi” (They dragged her in bonds”) when she tells Manrico, son of the count who condemned her mother, that she isn’t his mother because she accidently threw her own son into the flames where her mother was burning. Manricois portrayed by tenor Russell Thomas, last heard at the Lyric as Pollione in Norma in 2016-17, was fine before intermission when he appeared, at least opening night, as somewhat aloof with Lenora. After intermission, he did a wonderful “Ah! si, ben mio,” sung with more feeling and this time he really seemed to care about Lenora. The fourth singer of note is baritone Artur Rucinski, making his Lyric debut as Count di Luna. His “Il balen del suo sorriso” drew the bravos it deserved but he seemed to have to sing it standing still facing the audience as in a concert instead of moving with his words as more appropriate of today’s operas. Also debuting at the Lyric is bass Roberto Tagliavini, who was in excellent voice as Ferrando, captain of the guard. Based on Antonio Garcia Gutiérrez’s play, “El Trovador” (The Troubador), Verdi’s “Il Trovatore” took place in Spain during the15th century. However, the original director, David McVicar, moved it to the troubled Spain of the 19th century with its shadowy, grey darkness. The dark tone is set early on, captured by revival director Roy Rallo, set designer Charles Edwards and revival lighting designer Chris Maravich with a stage curtain of tortured faces, an opening scene of the 11th century Aljaferia Palace’s fortifications and interesting light. But the music is by incomparable Giuseppe Verdi and Marco Armiliato skillfully conducts the Lyric’s orchestra. So sit back and listen. Or watch the subtitles. The excellent libretto is by Salvadore Cammarano with additions by Leone Emanuel Baedare. 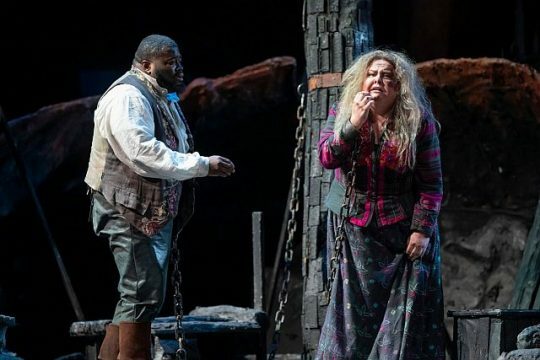 “Il Trovatore” is at the Lyric Opera of Chicago, 20 N. Wacker Dr. on select dates through Dec. 9. For tickets and other information visit Lyric Opera. Previous Previous post: ‘Miss Saigon’s’ heat is on!